Since last summer we have had occasional sightings of a white flash as a blackbird dived for cover, when we ambled past. 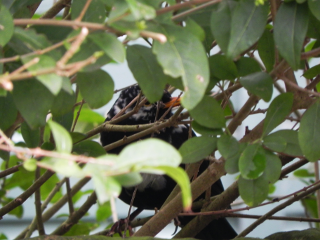 We looked on the RSPB web site and found that a blackbird with the odd white feather was not an unusual thing. They also mentioned that such birds didn’t usually last long as they weren’t popular with other birds of the same species and they were more visible to predators. Over the last eight or so months we have actually seen several birds, one with a white tail feather that is only visible when seen from the rear as he lands after flying, at least one with a white feather in one or the other wing. Again only noticeable when the bird is flying at the right angle, making it difficult to decide if this is the same bird we saw last time. It’s tempting to think that our friend with the white chest is being successful enough to spread his genes around. This condition, having some white feathers where there should be dark, is called leucism, quite distinct from albinism, where the bird is all white and has pink eyes. Then there’s the complimentary option, melanism, which is having dark feathers where they should be a pale colour. Then there is the Lockheed SR-71 Blackbird, the spy plane that replaced the A-12, that replaced the slow and clunky U2 – that kept getting shot down over Russia. The SR-71 Blackbird was quite a bit faster than the U2. In fact, at high speeds the air was squashed so much when it tried to get in the front of the engine, it became so hot that they couldn’t mix any fuel with it in case the turbine blades melted. They just diverted it straight to the back of the engine and burnt the fuel there as a ram jet. The Blackbird flies at over 85,000 feet and 2,000 miles an hour, it might have a spot of bother landing on our bird table.